In episode Brioche of TV show Bake with Anna Olson prepares Anna Olson recipe for Classic Brioche. Stir 1 cup of the milk, 2 Tbsp of the flour and the yeast together and let sit for about 5 minutes. Add the remaining milk, flour, sugar, eggs and salt to the first mixture and stir using a wooden spoon or in the bowl of a mixer fitted with the paddle attachment, mixing until blended (about 6 minutes by hand and 3 minutes in a mixer). Add the butter while mixing and once incorporated, switch to a dough hook attachment (or increasing action if by hand) and beat until the butter is fully incorporated and the dough is smooth. Place the dough in a large oiled bowl, cover with plastic and let rise at room temperature for 30 minutes, then chill for at least 8 hours, up to 24 hours. To shape the brioche, turn the chilled dough out onto a lightly floured work surface and divide it into 6 pieces. Shape each piece into a ball, flouring your hands and the dough as needed. Then shape each piece into a slight oblong shape, sort of like a snowman, with a head and body. Use your finger to poke a hole through the centre of the larger ?body? of the brioche and poke the smaller ball through it. Place each piece in an oiled 4-inch brioche tin. Cover the tins with a tea towel and let rise for 90 minutes, until doubled in size. 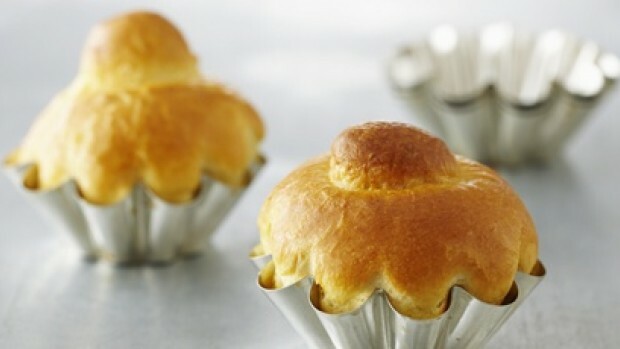 Preheat the oven to 350 F. Brush the tops of the brioche with the egg wash; place the tins on a baking tray and bake for about 25 minutes, until an even rich brown colour. 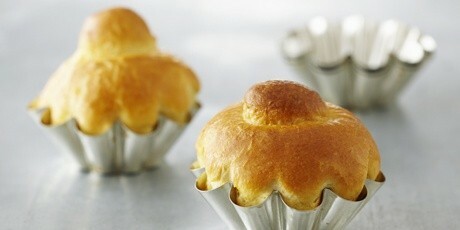 Cool the brioche for 15 minutes, then turn the brioche out of the tins to cool completely. The brioches are best enjoyed the day they are baked, but they will keep for a day in an airtight container, or can be frozen for up to 2 months.